UPDATE: YouTube hits 3 billion views a day | What Hi-Fi? YouTube has announced its latest set of record-breaking viewing figures. The site now enjoys three billion views a day – a 50% increase year-on-year – while more than 48 hours of new content is uploaded every minute. Earlier this month YouTube launched a movie rental service in the US, showing the platform's intent to further expand its influence. YouTube has today launched a movie rental service, with 3000 titles set to be available to watch online. Full-length blockbuster films will be accompanied by behind-the-scenes extras in the new service that launches in the US today. YouTube is now available on more than 350 million devices, with users watching on average of 15 minutes of content a day: a figure YouTube is hoping to improve. 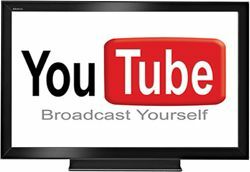 With smart TVs now offering direct access to YouTube, the service will clearly rival similar streaming services such as LoveFilm and Qriocity. There's no word on the service coming to the UK as yet, though we'd imagine it will be only a matter of time. YouTube is promising more details very soon. YouTube is set to bring full-length Hollywood films to online viewers in a new pay-per-view, on-demand venture. According to US website TheWrap, which covers Hollywood news, the service could launch as soon as next week. YouTube already offers full-length films to watch online but the new service would bring the service up to date with movies set to come online the same day the DVD/Blu-ray release goes on sale. Sony Pictures Entertainment, Universal and Warner Bros are all said to be on board with YouTube. With YouTube now accessible on most latest-generation, connected TVs, the deal will naturally be seen as a rival to the likes of Acetrax and LoveFilm, as well as Apple's iTunes Store and Sony's Qriocity service. With Amazon recently buying LoveFilm and Tesco purchasing Blinkbox, the battel to deliver on-demand video content looks set to be an interesting one in 2011.